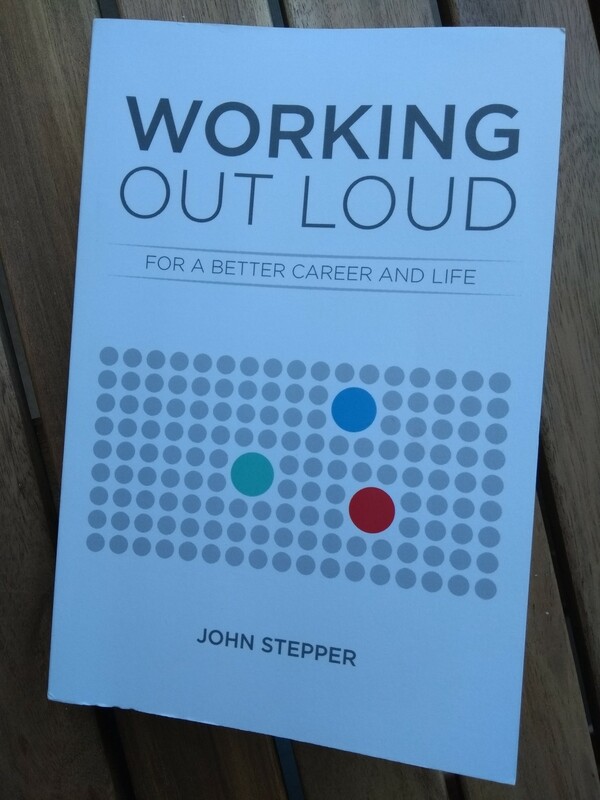 Working Out Loud is a book by John Stepper and describes a framework for taking control of your life and career. The short answer is intrinsic motivation - you will perform better when you are pursuing your own agenda instead of another's. You will also be happier - similar to what I wrote seven years ago about Scrum and Happiness Research, the core elements autonomy, competence and relatedness are also mentioned by Stepper. So Working Out Loud is not a productivity hack - it's an attitude of taking responsibility and having a more fulfilling life and work. Rather than finding a job you fit into, create the job that can only be done by you! These concepts are not new, but Stepper managed to assemble them in a way that makes them larger than the sum of their parts. You may have already used some of these strategies, but try them out in a synchronized, more balanced way. This basically means developing an entrepreneurial mindset about your life and career. Similar to The Lean Startup, you would start with a basic goal, show your work and get feedback, then learn and improve and pivot. Start small, goals will become more ambitious later on. Networking is easily associated with inauthentic, shallow conversation - don't be that way. 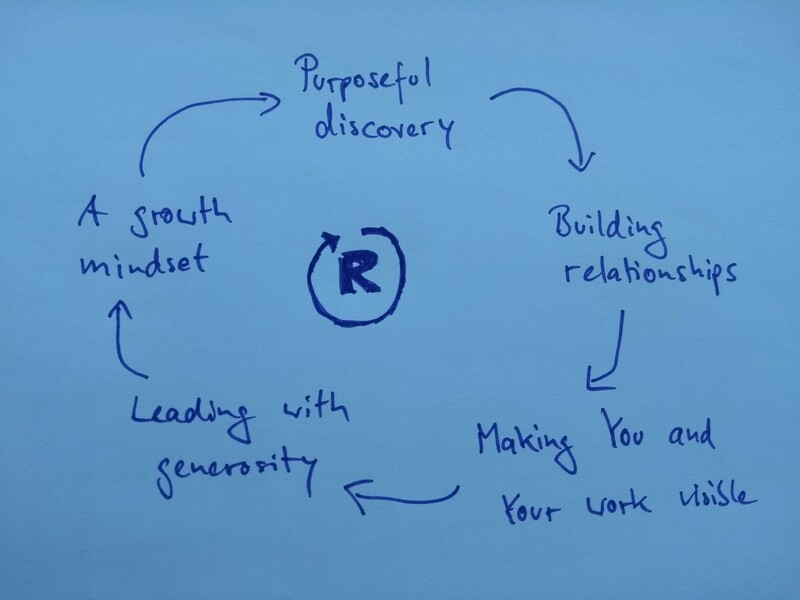 Employ generosity, vulnerability, candor and accountability to develop relationships in an authentic way. This will help you get access to knowledge, expertise and influence. Nowadays self-publishing is easy - get on social media, write a blog, use GitHub, and so on. Show what you do, communicate how and why you did it. The feedback will help you get better. Google yourself to see how visible your work is. "Leaders create a culture around their goal and involve others in their culture". John Stepper calls generosity the "currency of networking" - so creating a culture of generosity will lead to people being generous towards you too - just don't expect it of them. Similar to Kaizen, this means an attitude of continuous improvement. Don't think about getting good (this might sound too ambitious and paralyze you) - just try to get better. Make use of your network to identify where to improve and do it. Stepper spends a lot of time outlining a 12 week mastery program. The program is supposed to help you internalize the habits of Working Out Loud. Each chapter closes with small exercises that will keep you on track. It also mentions Working Out Loud circles, a scheduled weekly meeting with a peer group. There is an elaborate circle guide online, with specific instructions and suggestions. While these parts are not uninteresting, they are clearly targeted at people who have never employed any of the strategies above - think of it as training wheels. 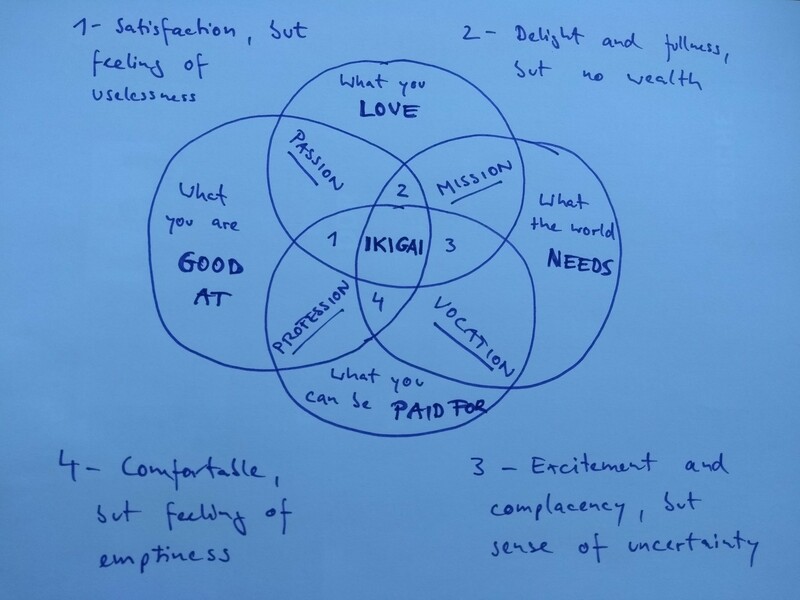 The Japanese islands of Okinawa are inhabitated by a people who are known to lead healthy, long lives - they have a concept called Ikigai, which can basically be described as a sense of purpose, or "the reason you get up in the morning". This is the final chapter in the book. From my experience, a few decades ago the norm was working in the lower left section of the diagram. And this is what schools and universities still prepare people for. While life in this section is satisfying and comfortable, people will ultimately feel useless and empty. I think what Working Out Loud can help you with is getting an idea about your Ikigai and developing the habits to get you started on your journey. After having read the book I feel energized and empowered to adjust some of my strategies and be more consistent in Working Out Loud. One aspect of Working Out Loud that was not highlighted enough in the book was effortlessness, as in Leo Babauta's excellent book The Effortless Life. Without a clear, achievable goal you will be distracted by other things - stuff other people tell you to do, stuff that prevents you from working on the skills you want to master. These things will feel like hard work, but things done by intrinsic motivation don't. And if the goal no longer energizes you, just pivot. An extended network will also minimize the time you dwell on problems alone - just ask someone and get pointed in the right direction. This saves time and energy. I also find that making work visible is hardly an extra effort, if you actually do it. A few years ago I started a blog called The Humble Developer, where I published very short posts on stuff I learnt during work. I'm surprised that I still get feedback about some of the posts quite frequently, compared with the little time I spent writing them. Nowadays I often find myself solving a complex problem for hours, without spending an extra ten minutes to write something about it - which is kind of stupid. I want to be more disciplined and work out louder from now on. Addition: I forgot to state the most obvious reason for Working Out Loud being almost effortless: The cycle above is a reinforcing loop in system theory. This means that it is designed to be effortless: each new iteration of the loop comes with more and better feedback and development opportunities - it's a virtuous cycle.